1.) Do you have stairs? If so, then you’re in luck. Play fetch with your dog at the top of the stairs, throw the ball down and let him run down, retrieve the ball and run it back up to you. This will wear him out fairly quickly, but be careful! Help him to learn not to run too fast down them, you don’t want an accident. 2.) Play Hide and Eat! Hide the food (pets favorite or any kind of treat) somewhere in the house (easy at first then it gets harder). Once its all hidden, let your pet loose to find the hidden treasures. They get to use their noses and a big treat when they find it. The treat makes it fun and you’ll be so proud of them. This entry was posted in Indoor activities, play on February 27, 2010 by yourfriends. Calling all BIRTHDAY doggies and kitties! We would LOVE to know when it’s your pet’s birthday or “gotcha” day. SEND YOUR PICTURES!! to yourfriends@kingsbrookvet.com so we can post them on our blog and facebook. If you are interested in throwing a birthday party for your pet, a great website for helpful hints is pamperedpuppy.com. Happy Belated “Gotcha” Day to Henry. Henry was adopted by our technician Melissa Sasu and her family in January 2004. This entry was posted in Birthday, Gotcha Day on February 24, 2010 by yourfriends. For most dogs who can be very enthusiastic and easily distracted, the gentle leader or easy walk harness are kind tools you can use to keep your dog in control and increase in enjoyment of your stroll together. 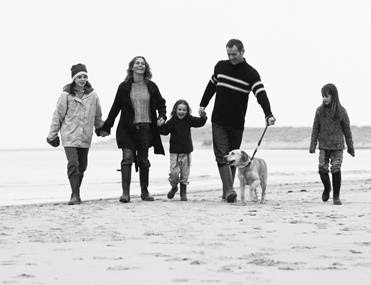 People have traditionally turned to choker or pinch collars when they have a dog that is strong and pulls on walks. It is a dogs nature to lean into pressure, so a strong dog with a high pain tolerance may continue to pull despite the use of these implements and then can potentially cause laryngeal irritation or even damage. Laryngeal damage can occur with repeated pressure from a traditional nylon collar as well. The gentle leader and easy walk harness are alternative devices used to walk your dog that work on pressure points. 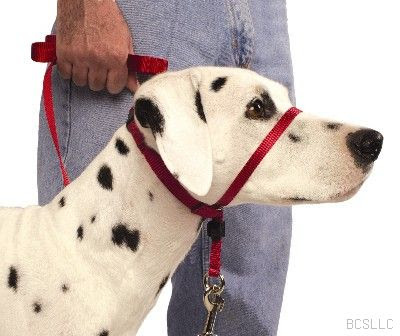 Instead of feeling the pressure of a collar in front of their neck into which they lean and pull harder away from the person walking them, with the gentle leader the pressure is felt at the base of the skull so dogs back into that pressure and with the easy walk harness the pressure is felt at the point of their shoulders and again when they back up. Proper fit of these devices is very important in order to use them successfully. We at Kingsbrook would be glad to help you fit either one of these products to your dog and answer any questions you may have about their use. This entry was posted in Easy Walk Harness, Gentle Leader on February 21, 2010 by yourfriends. There are only 3 animals w/ blue tongues; the black bear, the chowchow dog, and the blue tongued lizard. Toucans are found only in tropical areas of Central and South America. Some toucan spp. have bills more than half as long as their bodies. A beaver can hold it’s breath for 45 mins. The longest recorded life span of a tapeworm was 35 years. You’re 20 times more likely to be struck by lightening than to be bitten by a rattlesnake. A male angler fish attaches itself to a female and never lets go. Their vascular systems unite and the male becomes entirely dependent on the female’s blood for nutrition. A dog was the first animal in space and a sheep, a duck, and a rooster the first to fly in a hot air balloon. The elephant is the only mammal that can not jump. Stay tuned for more amazing and weird facts! If you find some you’d like to share please let us know! This entry was posted in Animal Facts, Tidbits, Weird Facts on February 18, 2010 by yourfriends. From the time your pet eats a meal until the time tartar starts to calcify on their teeth is only 48-72 hours? Once tartar is calcified the only way to remove it is with a professional cleaning. The bacteria that thrives in your pet’s mouth can infiltrate their heart, liver and kidneys through the bloodstream by way of bleeding and inflamed gums? There are things you can do at home to promote your pet’s dental health? Good to Chew: Giving your cat or dog a CET chew after a meal will coat their teeth with a dual enzyme system to control plaque and eliminate bacteria build-up. Greenies dental chews are also a good choice to help reduce plaque and tartar build-up. Better to Rinse: Using a Chlorhexadine oral rinse once daily for dogs and cats will help prevent plaque accumulation. Best to Brush: The best thing you can do for your pet’s teeth at home is to brush them at least once every other day (daily is even better!) 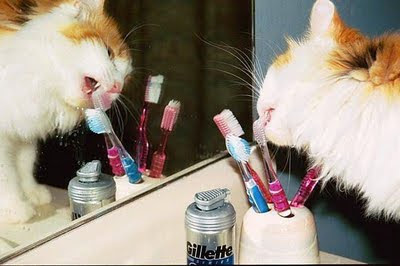 using an appropriate cat or dog toothbrush and an enzymatic toothpaste made specifically for animals. Diet: There are also specialized diets available for pets that promote healthy teeth and gums. The two that we recommend are Hill’s Prescription diet T/D (available only through veterinarians) or any Eukanuba dry pet food with the MCC system (available at most pet stores). OraVet Plaque Prevention Gel: Once a barrier sealant is applied to your pet’s teeth you can begin doing a weekly application of this gel to prevent plaque and tartar forming bacteria from attaching to your pet’s teeth. Professional Cleaning: A professional cleaning is done under anesthesia. Anesthesia is necessary so that the calculus that has formed under the gum line as well as on the crown of the tooth can be removed. Once cleaned, the teeth are polished and treated with a fluoride foam and OraVet sealant. Dental radiographs: If any abnormalities are noted during the cleaning dental radiographs are required. The radiographs allow us to view the tooth root and surrounding bone. After reviewing the radiographs, the veterinarian can determine if a tooth is damaged and needs further treatment. For more information or for pricing on a professional cleaning, call us at 301-631-6900. This entry was posted in dental care, dental recommendations on February 15, 2010 by yourfriends. This entry was posted in exercise, Hiking on February 12, 2010 by yourfriends. A New show on Animal Planet…Pit Bulls and Parolees! “Pit bulls are eager to please, faithful and enthusiastic friends and pleasant with children according to credible canine organizations. Really, it’s true. Yet, the public largely associates these dogs with fear, danger and unyielding aggression toward people. Pit bulls actually were once ranked among American’s top five favorite pets and also known as the “nanny dog” for their gentleness with children. But they have fallen from grace. Now often associated with gang members, dog fighting and attacks, pit bulls are misunderstood, misjudged and under-appreciated. 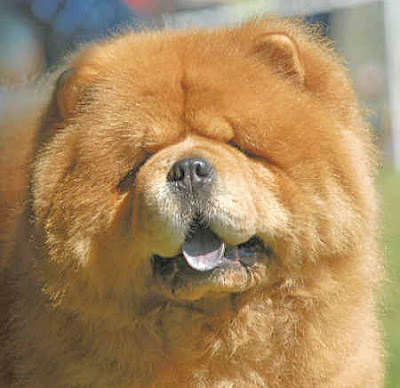 Their bad rap stems from many misconceptions – the biggest is that they are “killer” dogs that pose a threat to society. While most dogs are known as man’s best friend, people have lost hope for the pit bull. This entry was posted in Animal Planet, Pit Bulls and Parolees on February 9, 2010 by yourfriends. “Wags for Hope is a non-profit organization that provides volunteers with their pets to bring joy to the lives of others. 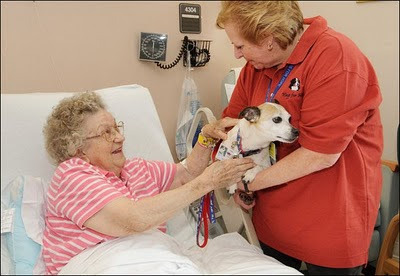 We call on nursing homes, assisted living and hospice facilities, among other places. In addition, we supply local libraries and schools with certified R.E.A.D.® teams, who are using their animals as a conduit to help improve the literacy skills of the children in our community. We aspire to be a “one-stop shopping” organization supplying animal visitations for therapy purposes wherever needed in northwestern Maryland. We are always seeking volunteers who would like to contribute a little of their time per month with their pets. This entry was posted in Volunteer, Wags for Hope on February 6, 2010 by yourfriends. If folks we’re more like you! This entry was posted in Hope Marrington Molb, Poem on February 3, 2010 by yourfriends.